AAPL looked quite impressive last week. 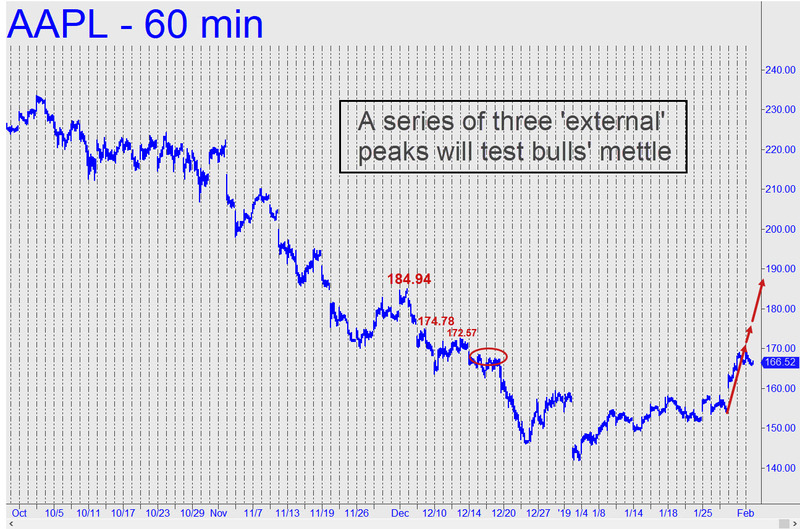 Buyers pushed above a shelf-like ‘external’ peak from mid-December, refreshing the bullish energy of the hourly chart. And now, how high would the stock have to go to make this short squeeze look capable of achieving new all-time highs above $233? My gut feeling is that it would take a push exceeding the 184.94 peak shown (see inset) to do the trick. That would plant a seed of fatalism in the minds of bears, your editor among them, who expect the rally to fizzle out any day now. I won’t pretend to have a crystal ball, and can only suggesting monitoring AAPL’s progress, or perhaps lack of it, relative to the peaks shown in the chart. _______ UPDATE (Feb 7, 10:45 p.m. ET): The stock rolled down hard after a rally in the first hour failed to exceed any prior peaks. The weakness would not threaten the still-bullish look of the hourly chart, however, unless it takes the 165.93 low recorded on Feb 1..